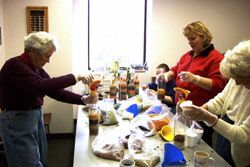 Margaret Ferguson, Mary Lou Linton and Doreen Brown prepare Friendship Bean Soup, Christmas Light Bottles, Cookbooks and Cookie Mix Jars which make thoughtful and useful Christmas Gifts. The Friendship Soup is $6.00, Christmas Light bottles are $10.00 and Cookie Mix Jars are now priced to sell for $7.00 at Prince Edward Community Care's Thrift Shop, 281 Main Street Picton, and The Community Care office in The Armoury, 206 Main Street Picton. Supplies are limited so shop early. Funds raised through the sale of these items will be used to help older people to live at home.